Turmeric (Curcuma longa) is the root of a plant which is in the same family as Ginger. The flesh is a bright orange and dries to a deep yellow-orange color. 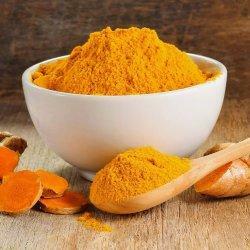 Turmeric adds the familiar color to most blended curry powders. This flowering perennial has been cultivated for over 2000 years in India, China and the Middle East. Turmeric was worshipped in ancient times as one of the sun spices because of its yellow color. Turmeric is used as both a dye and a digestive aid, in fact it has just recently been patented in the US as a topical disinfectant. Often also spelled tumeric, termeric, tumric, termric.Suggested Use: Turmeric is one of the important and common spices for Indian Masala Blends along with coriander, cumin, pepper and a variety of other spices. Turmeric can be used to flavor egg dishes, basting liquids, sauces, poultry, fish, beans and lentils. The RRDi is an Amazon Affiliate. By clicking below on the image and purchasing the item, the RRDi receives a small fee. Thanks. Please post your experience using any of these products in this thread. "Turmeric can even help prevent acne, cancer, allergies, diabetes, joint pain, and depression."